This time last year, InXile were collecting cash for what is still the third most-funded Kickstarter game to date, behind only Project Eternity and Double Fine Adventure – Wasteland 2. But even before development on that project is finished, they’re preparing to take to Kickstarter again to raise funds for Torment: Tides of Numenera, a spiritual sequel to Black Isle’s much-loved Planescape RPG. InXile head Brian Fargo said in an interview with GamesBeat that he intends to abandon traditional publishing models altogether, noting that the backing of big publishers or venture capitalists is increasingly tough to acquire for mid-sized studios like his. That means InXile will need to get preproduction started on Torment, to ensure the project is ready to take the full weight of InXile’s dev team once work finishes on Wasteland 2. 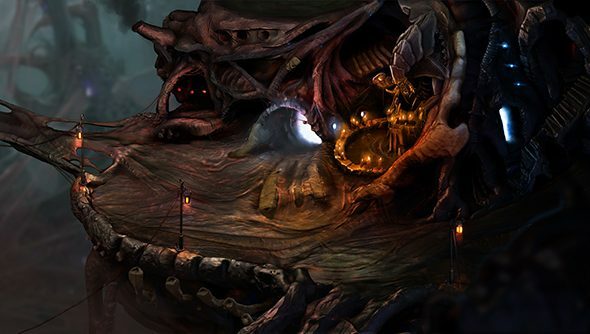 If InXile reach their funding target, a team of 10 writers and four artists will head up work on the game for nine months or so. After that, development will begin in earnest under the stewardship of one Kevin Saunders, a refugee from Obsidian. It’s that last detail I’m most excited about. Saunders has previously led work on two really excellent Neverwinter Nights 2 expansions – Mask of the Betrayer and Storm of Zehir – and the similarly brilliant, franchise-shaming Dungeon Siege 3. Fargo told VentureBeat that InXile are hoping to raise $1 million, though he’ll match every dollar raised above that with a further 10 percent from his own coffers. Like Wasteland 2, Torment: Tides of Numenera will run on Unity. It’ll be DRM-free, and be released for PC, Mac, and possibly Linux. Gosh. It sounds really good, doesn’t it?